Remember my last post? The one with the Semmelknödel, where I told you I wasn't an expert in cooking dumplings? Well, I am definitely an expert in cooking Blaukraut (not that I'm gloating here). 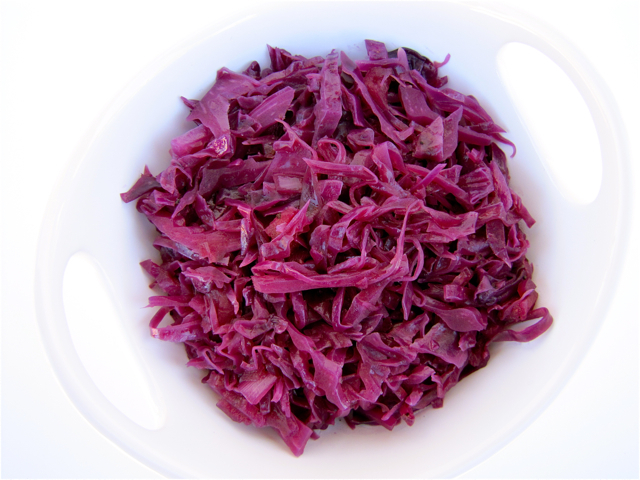 Blaukraut literally translates into "blue cabbage" and the name is mainly used in southern Germany. 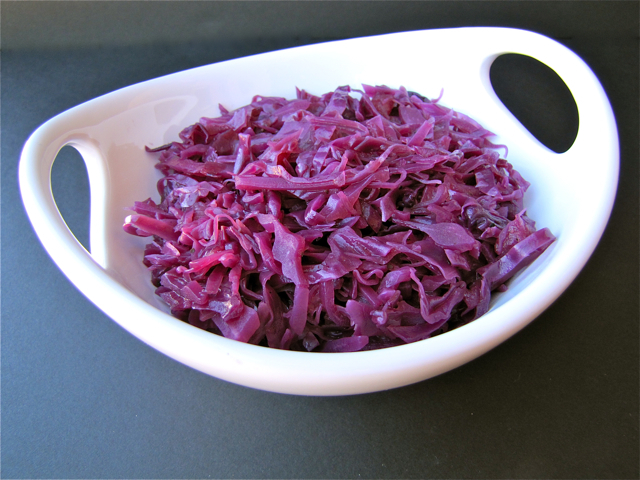 Most areas in Germany though either call this Rotkraut or Rotkohl which means "red cabbage". I've been cooking Blaukraut for probably 20 years and by now I don't even need a recipe anymore. I usually don't measure my ingredients and know exactly just what and how much to add to achieve a consistent tasting cabbage each and every time. However, just for you, my wonderful blog readers, I had my kitchen helper (my daughter) write down everything I did as I went along. Most Americans are familiar with Sauerkraut and while we Germans do tend to eat that a lot (and no, we don't wear "Lederhosen" all day long), Blaukraut is cooked just as often and is another treasured German recipe that most families cook quite frequently. Blaukraut is so versatile and can be served alongside many dishes like German dumplings, Spaetzle, or mashed potatoes. In restaurants it is a given that it is served with Sauerbraten, venison, boar and goose. I've always loved Blaukraut and we had it a lot growing up since red cabbage was bountiful every year from my parent's and grandparent's vegetable gardens. Cabbage tends to be ready for harvest in the fall and we mostly ate this throughout the colder months. My mom would cook several cabbage heads at a time and freeze the leftovers, which works beautifully. Cooking Blaukraut is fairly easy as long as you consider a few simple steps. You can shred the cabbage by hand, but if your knife skills aren't that great, go ahead and use a mandolin or the shredding blade of a food processor which will always give you consistent results. I find it also very important to "layer" my cabbage while cooking it. 2-3 layers are sufficient and each layer will receive lots of love from the ingredients, which will ensure a great tasting side dish. Not many ingredients are needed, but it does call for vegetable bouillon cubes which impart great flavor. A good tasting sweet apple (like pink lady) is also important, and while I love Granny Smith for most of my baking, they are too tart for this recipe. Last, but certainly not least, a little bit of a good tasting red wine is added (do not use cooking wine!) which along with the vinegar doesn't add flavor, but also helps preserve the beautiful color of the cabbage. This time around I served the Blaukraut with my German Sauerbraten and Semmelknödel, but it is a wonderful side dish that is tasty alongside all kinds of meals and goes extremely well with a beef pot roast. My family (including the kids) love this recipe and so has every guest that has ever had it served in our house. I know, strong statement, but it is just that good! Heat olive oil in a large pot over medium heat. Add the onions and saute until translucent. Add the 1/3 cup of red wine. Add 1/2 of the shredded cabbage, 1/2 of the apple, 1 bouillon cube, 2 tablespoons vinegar, 1/2 teaspoon of sugar, 1/2 cup of water, season with 1/2 teaspoon of salt and 1/8 teaspoon of pepper. Repeat the layer adding the other half of the ingredients in the same fashion. Give a quick stir, cover and simmer for about 20 - 30 minutes or until the cabbage is soft. At this point stir, taste for seasonings and adjust if a little more salt and pepper is needed. What a gorgeous dish and something I have never tried, lovely pictures! I am so glad you are back to blogging! Rotkohl is my absolute favourite German side dish, but because it's so easy to get ready made one here (well, Germany ;)), I've never tried to make it from scratch. It sounds quite easy to make though, maybe I should give it a go one day! Thanks for sharing, Susi. my grandma used to make something similar but with white cabbage. Ich liebe Rotkohl!!! Besonders gerne esse ich es mit Klößen und/oder Putenbraten! Oh Susi this sounds divine! I though that you used beets to get that rich color..looks fantastic!!! My husband loves cabbage and I don't know why I've never cooked red cabbage. I'm definately going to give this one a try. Also, I'm glad you are going to post more German recipes. It is cuisine I am not experienced with. What a fabulous photo with the blue background...stunning! I love cabbage in all forms and know I would adore this version, Susi! I love Rotkraut - and your pictures are amazing. I found your blog a few days ago. As a fellow German, I feel right at home here and I have a feeling that I will visit quite a bit. My most recent cooking adventure happened to be Rotkraut, too. I would love it, if you'd stop by and check it out. My next cooking adventure will probably be Dampfnudeln. Are you familiar with them? I love cabbage and this actually reminds me of a side dish I get at a local vegetarian restaurant. I always wanted to make it myself so I'll have to try your version! I love the beautiful color of the cabbage in this dish. This is one of those side dishes that would steal the show from the main. I love cabbage, this sounds amazing! I would totally eat this wearing Lederhosen! I've wanted a great blaukrout recipe for at least a dozen years. Thanks Suzi! I've never heard of this dish before Susi but I love red cabbage! Looks delicious - bet it would of been good on the pulled pork sandwiches I made yesterday instead of cole slaw! Smile. I want to try this right now...I adore cabbage, and I can only imagine how delicious this sweet and salty side dish must taste. Thank you for sharing, sweet woman. You are the expert here! I'm making this as soon as I can. Hi, I made this from scratch in a crock pot. Most of the color came out and the cabbage was pink. I reduced the cabbage water and added back to the cabbage. Maybe the crock pot was not such a good idea? I also grew up eating Blaukraut.....(my Nana was from Friedrichshafen on the Bodensee). However she always put in golden raisins and caraway. I don't know if that was particular to the area or just her own touch, but it has always been a family favourite! Love your blog. I'll have to read through your past posts. Looks delicious! Hi! 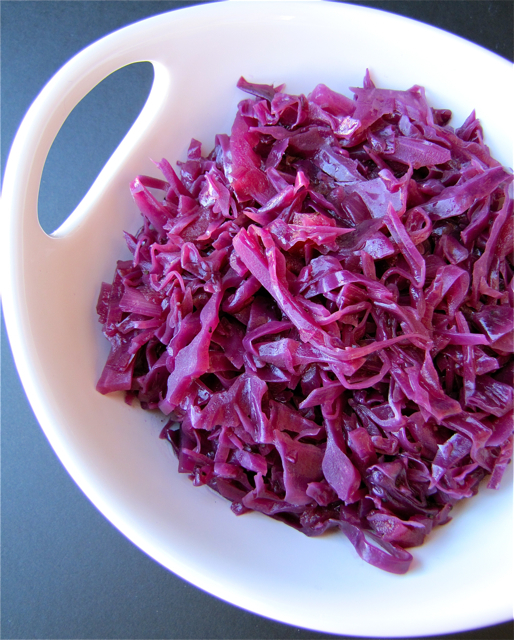 I am new to this, but have loved German Red Cabbage since I was a child! Can you tell me if it can be canned... or do you recommend only freezing? We have had electric power go out here in Ohio and so I would like the canning recipe if possible. My husband and I planted cabbage (with this in mind) to make for my 80 yr old dad,his twin, and his older brother, in honor of their German grandparents. I made this yesterday for an (early) Octoberfest party, and it was almost a bigger hit than the beer! I will definitely be making this again (though I also added a stick of cinnamon, a pinch of cloves, and probably a teaspoon or two of caraway seeds). We are new residents of Germany, and I made this dish as an experiment...well, it was a huge success! This is a great recipe, easy and delicious. I'm currently making this dish for the second time in 2 weeks! My boyfriend LOVES it! I like it too! Thanks! I wouldn't use Olive Oil, but rather Butter, or Sunflower Oil.In my oppinion, Olive Oil spoils the taste! A great tip is to soak the Red Cabbage in Vinegar and Salt over night, before cooking. My mom always used to add caraway seeds, pimentos a cinamon stick and 2 Bayleaves whilst cooking. As a native from Austria I grew up eating Blaukraut. I use Apple Juice instead of Red Wine. My kids love it!! after returning from a trip to Germany, my husband and I have been craving these flavors, and this dish in particular. It is on the stove as I write! I am planning on preparing this side dish as part of an Oktoberfest gathering. I will be having 20 - 25 attending. Can anyone tell me if I should double the recipe and will it keep warm nicely in a crock pot? Hi Kimmie, I would most definitely double the recipe (you will need a big pot, but it will cook down). I don't see a problem keeping it warm in a crockpot either once it it is cooked. I often cook it a couple of days prior to when I need it and just keep it in the refrigerator until ready to use. Just make sure that the Kraut still has a little "bite" to it so it doesn't get too mushy once re-heated. Also if you happen to have leftovers after your Oktoberfest gathering, the Kraut freezes exceptionally well. Enjoy! Susi's Kochen und Backen 1st Blogoversary!